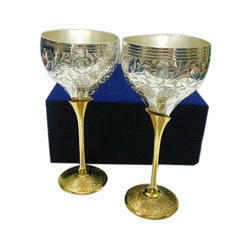 We are engaged in providing a wide range of Silver Gold Plated Glass Set to our clients. 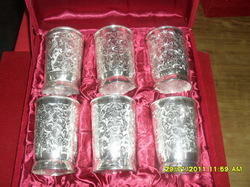 Our silver plated Glass are made from high quality brass and can be used in home to serve guest any drink in it. i will give a royal look. Decorative Glass and Bowl Sets available in Whole sale prices. For more Variety and products contact us. With our vast experience & knowledge in this field, we are engaged in providing a quality-assured range of Silver Plated Wine Glass Set.